This 4” diameter old style Porter Cable Multi-Tool fitting circular saw blade is made from M2 high speed steel and is excellent for wood and metal cutting. Use this HSS blade for cutting metal up to 20 gauge thick. 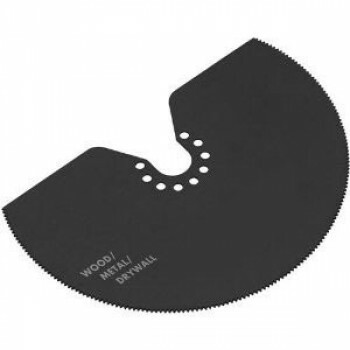 The segmented (flat side) of this blade allows you to cut all the way to the corners or to any other stop surfaces without any over-cutting damage. Comparable to the Porter Cable PC3013 blade, this cutter is great for making precise cuts in nail embedded wood or plaster. Also well suited for cutting drywall, plastics, copper, tin and aluminum. The circular design makes it easier to achieve those longer span cuts because a circular blade allows for greater control and stability as you follow your cut line. Our PCM3013X Segmented Circle Blade is designed to be compatible with the Porter Cable PC3013 blade and is excellent for fine tooth cutting of thinner sheet metals, all woods and most plastics. This circular cutter is flat (segmented) on one side to get you into the corners.